(Full Article) Another massive reduction in the local shipbuilding workforce may come as most shipyards are still struggling with falling orders and mounting losses, industry sources said Friday. Hyundai Heavy Industries Co., one of the country’s top three shipbuilders, is set to announce its restructuring plans next week, which may include a 10 percent cut of its workforce, which would mean about 3,000 workers would leave the company. Hyundai Heavy’s local rivals are also expected to sharply reduce their workforces this year, with their subcontractors being forced to follow suit. Samsung Heavy Industries Co. has been implementing an early retirement scheme since last year, and Daewoo Shipbuilding & Marine Engineering Co., is working to streamline its business lines through a spin-off. Hit by an industrywide slump and increased costs, the nation’s big three shipyards — Hyundai Heavy Industries, Daewoo Shipbuilding & Marine Engineering and Samsung Heavy Industries — racked up a combined loss of 7.7 trillion won last year. It was the first time that all three of the nation’s largest industry players registered losses. 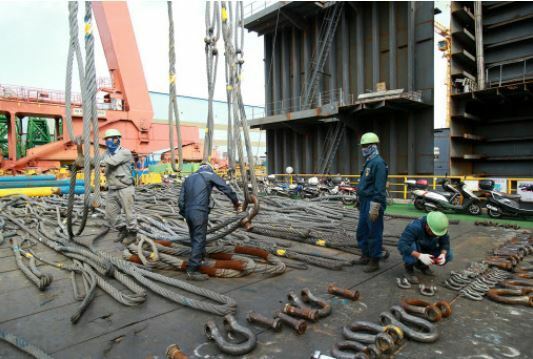 According to the data by global researcher Clarkson Research Services, South Korean shipbuilders had an order backlog totaling 27.59 million compensated gross tons as of end-March, the lowest since March 2004, when the comparable figure was 27.52 million CGTs. Last year, a total of 15,000 workers left Hyundai Heavy and eight other shipyards, with the total number of workers at the companies falling to 195,000. The number of employees in the shipbuilding sector had been sharply increasing since 2005 in line with a sharp rise in demand for new ships, reaching 143,000 in 2007 and 169,000 in 2012. Local shipyards are striving to tide over worsening business conditions but have failed to clinch new large orders for the past three months, feeling the pinch of low demand.